(Toronto, ON) - Take Notice. Up and coming Toronto hip hop emcees J Shiltz and MC FÜBB (The Cypher, Hip Hop Headz/H3) and NYC veteranWordsworth (eMC) have come together over a banging instrumental by Juno-nominated producer Fresh Kils and collaborator Bix. With cuts courtesy of Halifax DJ Uncle Fester (The Extremities), listeners can expect a metaphorical massacre of brilliant lyrics, an awe-inspiring display of flows, and distinct deliveries from these three masterful microphone controllers. It’s become an almost cliché complaint of hip hop music lovers that the rap scene is saturated with a plethora of artists, making it hard to find real talent amidst the mire of unexceptional music that is released. 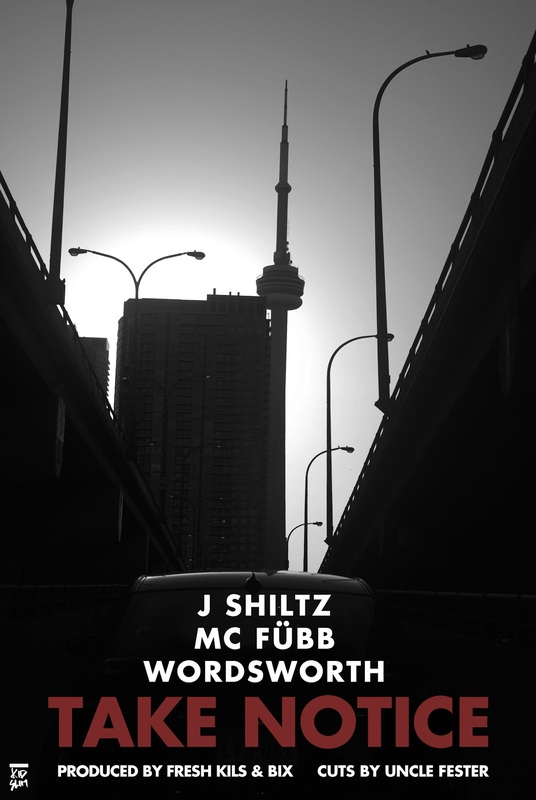 With Take Notice, J Shiltz, MC FÜBB, and Wordsworth are making it clear that they have the skills necessary to stand out and excel in the rap industry (and demanding that those who aren’t up to par quit rapping). Hip hop heads everywhere need to Take Notice - this year they will get the music they deserve. As his name suggests, Brooklyn-bred artist Wordsworth is the epitome of a true hip hop wordsmith. In addition to appearing on a multitude of other artists' albums, such as Black Star, A Tribe Called Quest: The Love Movement, and Lyricist Lounge Vols. 1 and 2, he co-created, starred in, co-wrote and produced MTV's ground-breaking sketch comedy series The Lyricist Lounge Show. Since then he has released his acclaimed solo album titled Mirror Music and featured work in video games such as Saints Row to movie soundtracks such as The SpongeBob SquarePants Movie. Also, some of his recent works include The Dino 5, a children's hip hop album produced by legendary producer Prince Paul. In the midst of that, he released an album called The Show with his supergroup eMC, which consist of members Stricklin, Punchline and Masta Ace. He also appears in the Kevin Fitzgerald film Freestyle: The Art of Rhyme. His sophomore album is being released later this year.